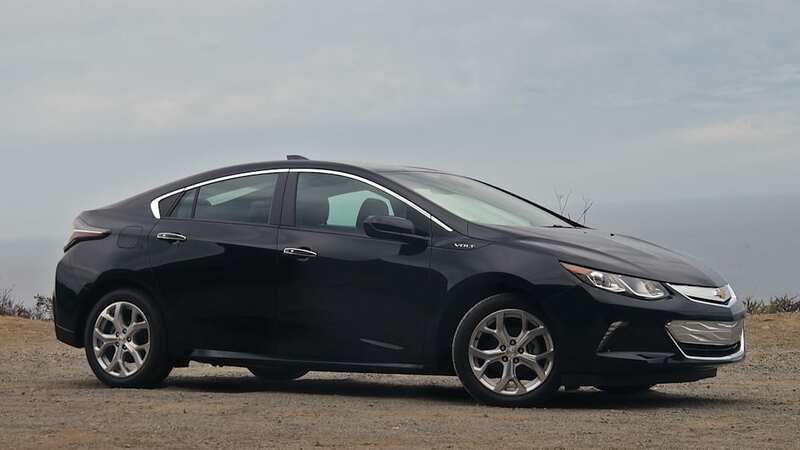 Autoblog rating for the Chevrolet Volt is not available. Please check back later. 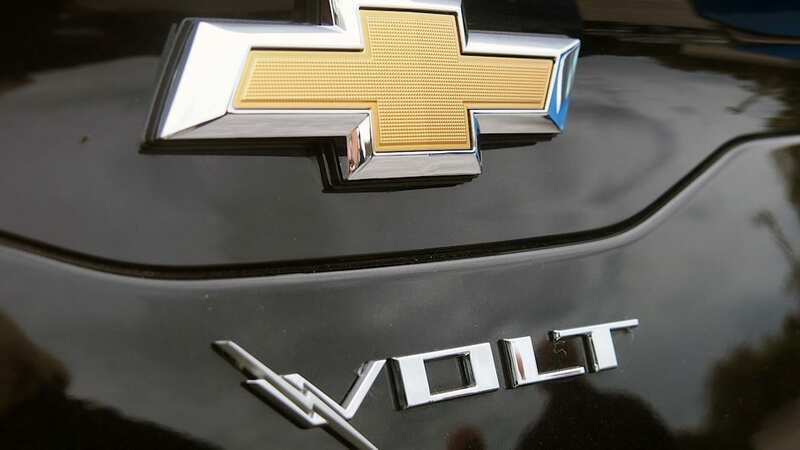 There's a hit vehicle hiding in GM's formula for the Chevy Volt. You can sense it in the enthusiasm that current Volt drivers have for their cars. You can see it in the amount of money GM has poured into its extended-range electric vehicle project. And perhaps most importantly, you can feel it from the driver's seat of the new, second-gen model. The big question is whether or not GM will be able to turn its much-hyped 'halo car' into a best-seller this time around. After driving it in northern California, I can tell you that the Volt is tremendous. But we all know it takes more than that to create a hit. GM has so far sold over 82,000 Volts in the US. That's respectable, but in the early, glory days before the car launched, company representatives were talking about much more impressive numbers. 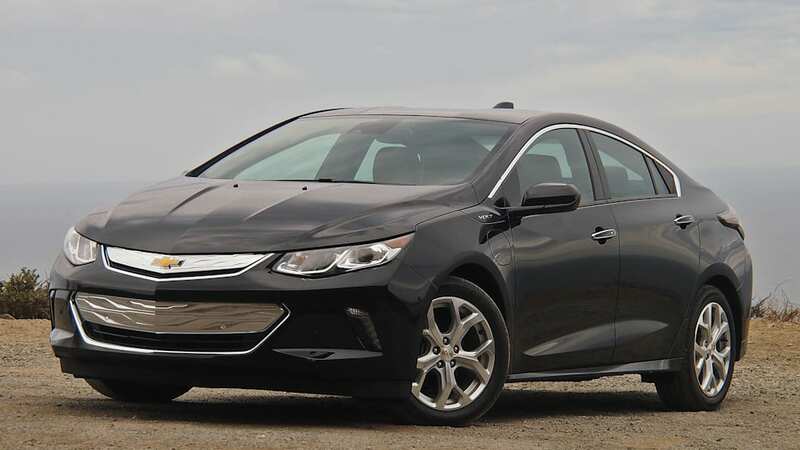 With a few years to talk to customers and potential prospects, GM has learned a lot about what makes someone buy a Volt. 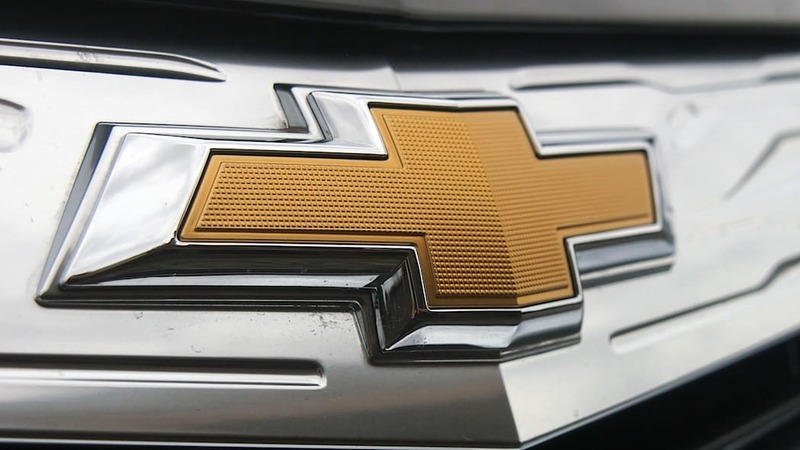 For the 2016 model, Chevy has changed just about everything for the better. 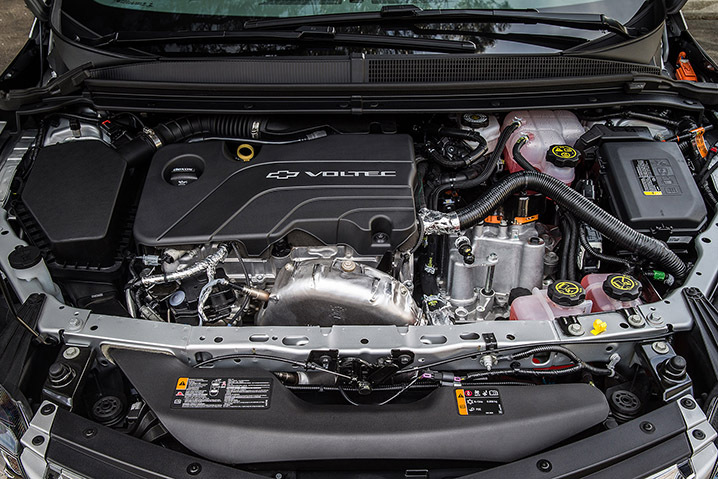 The new Volt has more all-electric range (53 miles vs. 38 in the first generation), is more fuel efficient whether you're looking at the overall value (106 combined MPGe vs. 98) or just when the car burns gas (42 miles per gallon vs. 37). All of that means that the car's overall range is bumped up to 420 miles, from 380. The battery is smaller and lighter while offering more energy capacity. The range-extending gas engine is bigger (1.5 liters vs. 1.4) but it's also more efficient and can burn regular gasoline instead of just premium. 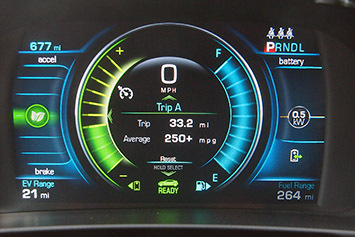 The Volt's overall range is bumped up to 420 miles, from 380. The cost is lower, too: $33,995 vs. $34,170, before incentives. This is a car that GM thinks will compete against the Toyota Priuses and Nissan Leafs of the world (as its new ads make abundantly clear). All three cars have completely different powertrains, but we all know that they're the headline green cars of our time (along with Tesla), so buyers will have to want to pony up a bit more money if they like what the Volt is offering. 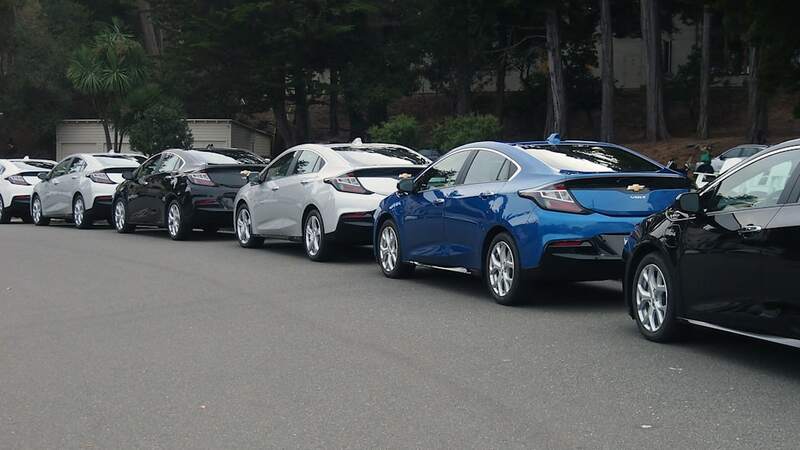 The 2016 Leaf with its 107-mile range starts at $37,640 (before incentives), while a 2015 Prius can be had for $25,035 (pricing for the 2016 has not yet been announced). 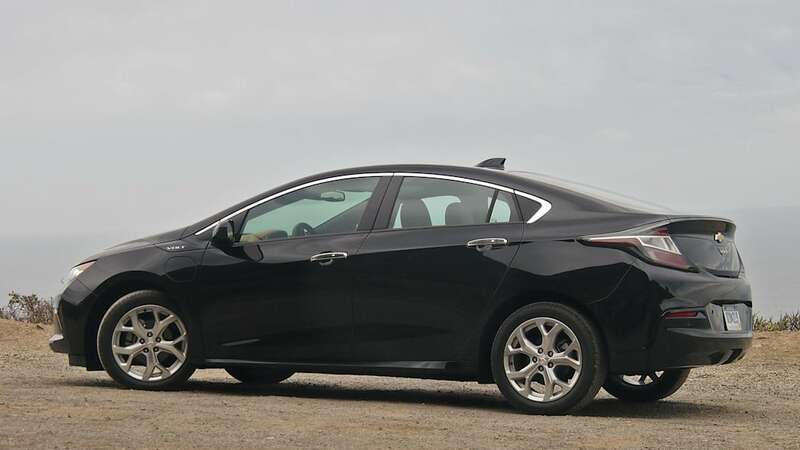 So, on paper, the new Volt is an all-around winner. I'm here to tell you that it wins on the road, too. You can't help but notice the changes. They are literally front and center. 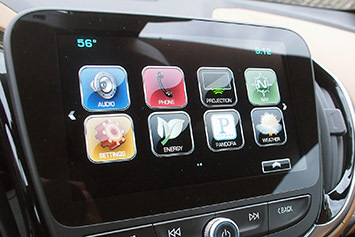 When GM introduced the first Volt, the world was enamored by chic while iPods, and the Volt design team thought a giant, touch-sensitive panel was a way to make us love their plug-in car. 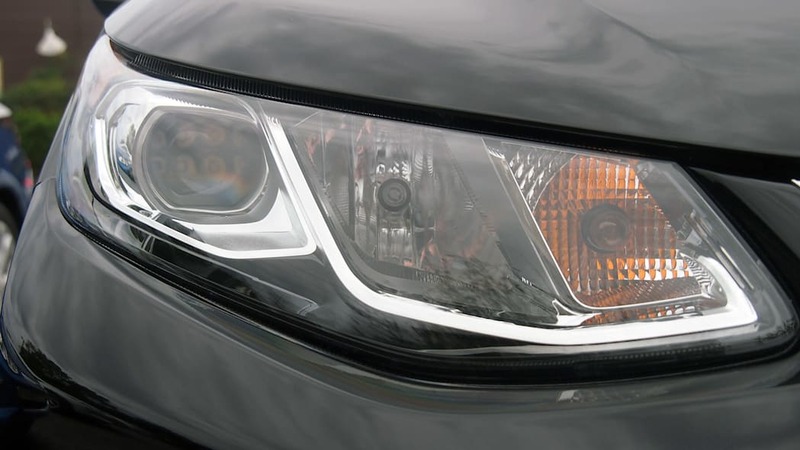 Instead, that was one of the worst features of the first Volt. In the new model, the panel has been deleted like skeuomorphic design in iOS. 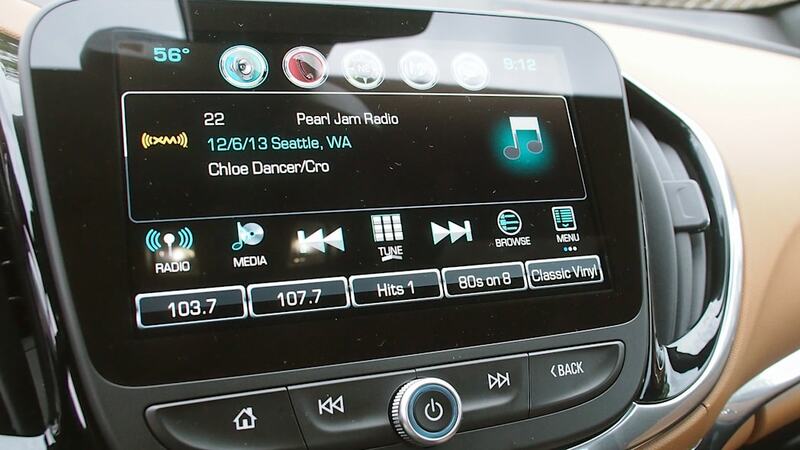 In it's place is a perfectly sized, eight-inch infotainment screen and HVAC controls. 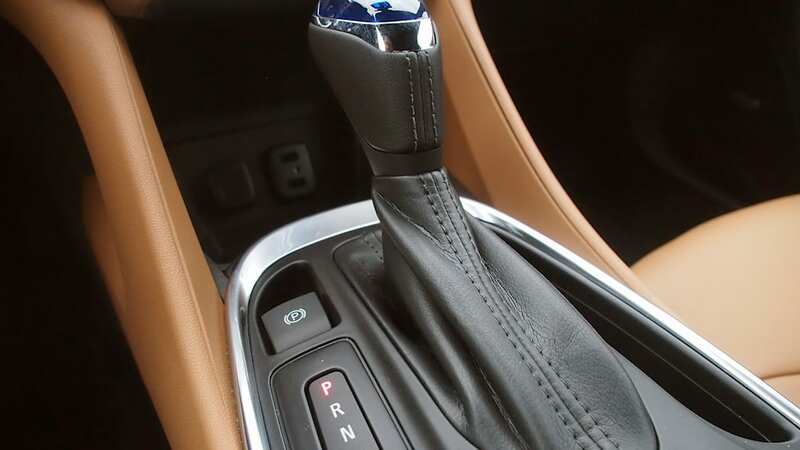 It feels strange to give thanks for real, physical buttons, but it's simply true that they work better in almost all vehicles than a touchy-feely flat surface. 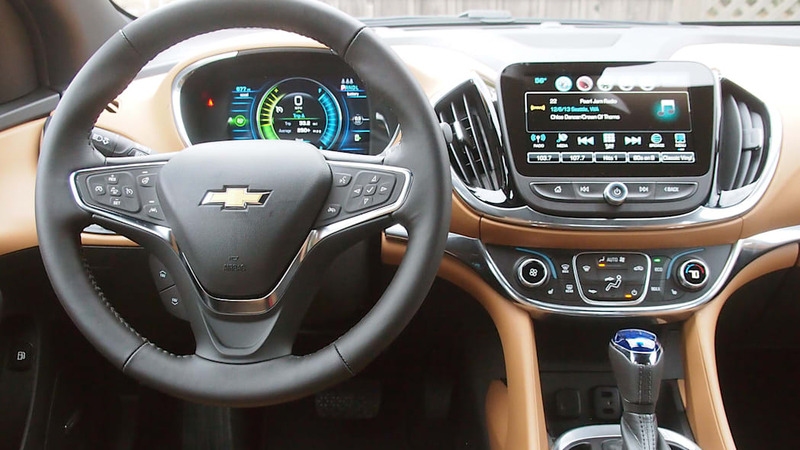 Despite the new look that takes a step away from the iPod-ness of the original, the new Volt will totally love your smartphone, thanks to built-in Apple CarPlay and Android Auto software. 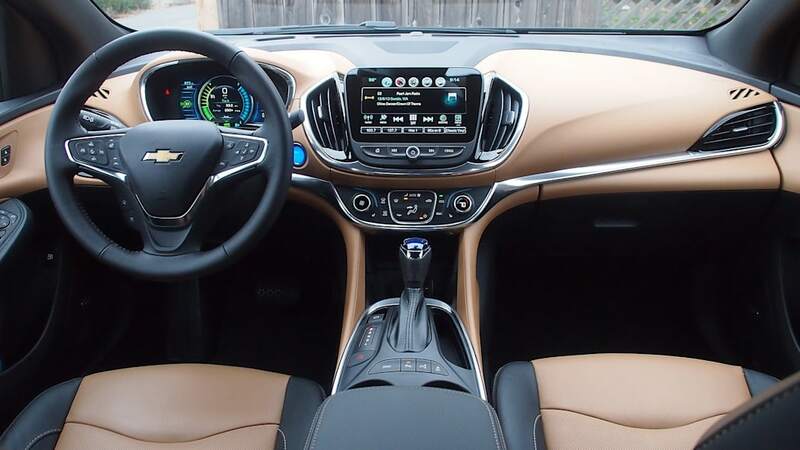 The new Volt seats five, instead of four, and the interior and exterior have both been upgraded to something I would truly like to see in my driveway every morning. 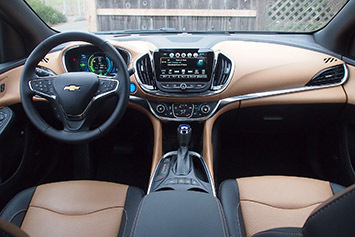 The new Volt seats five, instead of four, and the interior and exterior have both been upgraded to something I would truly like to see in my driveway every morning. My test vehicle had the Jet Black/Brandy two-tone interior. It looks great, but the big brown swoops of color that extend the inside of the door to the top of this dashboard can be a hassle. In the right sunlight, these threw unfortunate beige reflections onto the windshield. 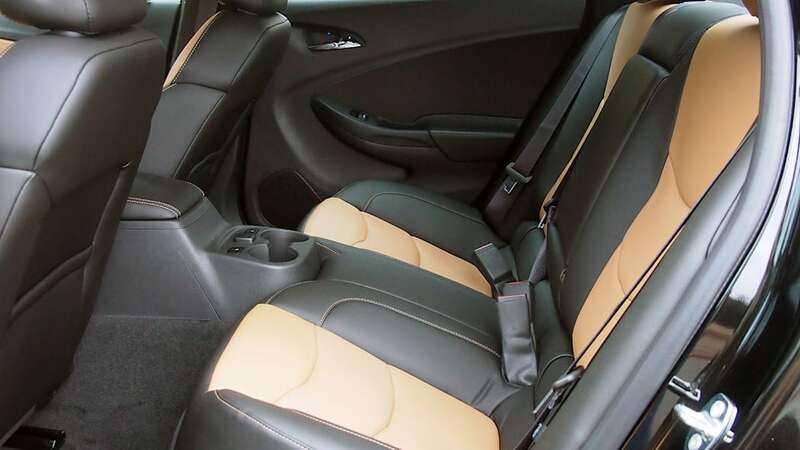 I was able to look through them most of the time when I focused on the driving, but if I were to buy a 2016 Volt, I'd choose a darker material here, for sure (there are four interior color and material options, with the most expensive leather adding $1,340 to the price). While there's plenty of room in the front seats for two fullsize adults, the rear really only seats three in a pinch. 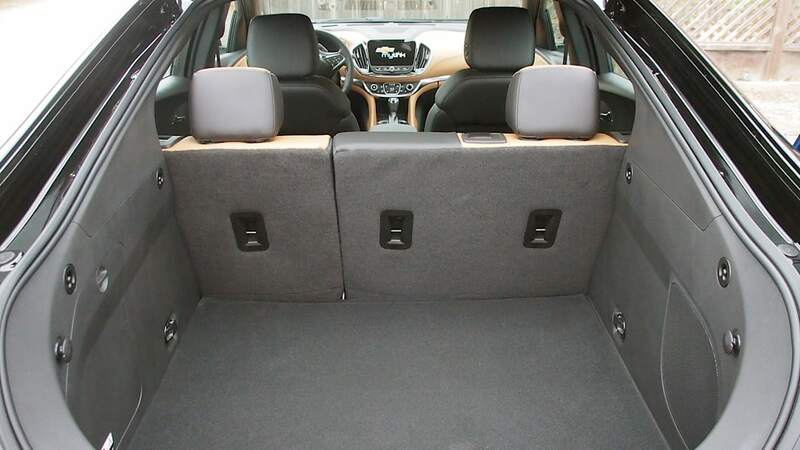 Unlike in the first-gen Volt, the battery pack no longer bumps up into the rear seats. Sadly, it still runs through the rear seat leg area, so whoever sits in the middle will have to straddle the bulge the whole time. It's a small price to pay for the efficiency you gain, but something to be aware of. 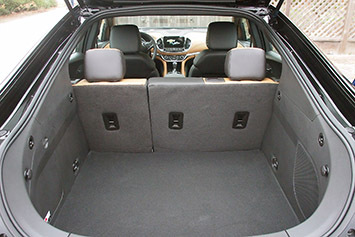 If you're not trying to go all clown car with the Volt, there is enough head- and legroom in the front and back to fit four adults in the car, unless your friends all have six-foot, two-inch frames. 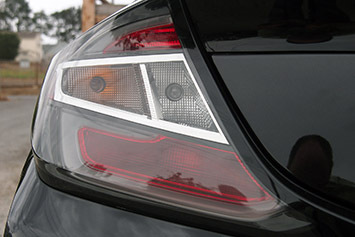 Looks are subjective, but I find the 2016 Volt to be a fine piece of aerodynamic muscle. As wind tunnel time becomes more and more important, the general "aero" shape that defines cars like the Volt and the Prius are going to get more and more prevalent. 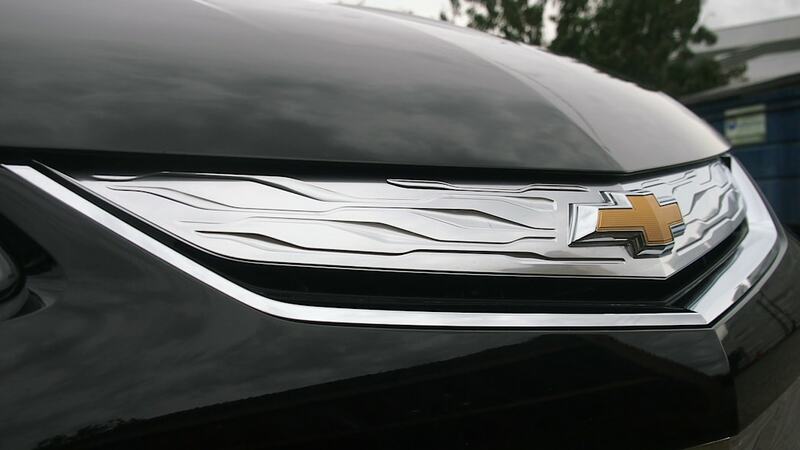 To find an identity within that shape is going to become more of a challenge, but GM is onto something with the Volt's evolution. There are no wasted lines, no excess shapes. 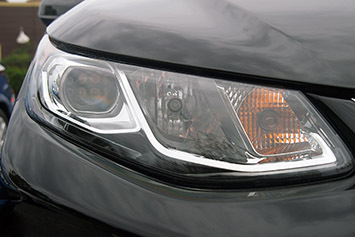 The design is clean without being bland, and the new look even comes with better rear visibility from the driver's seat. 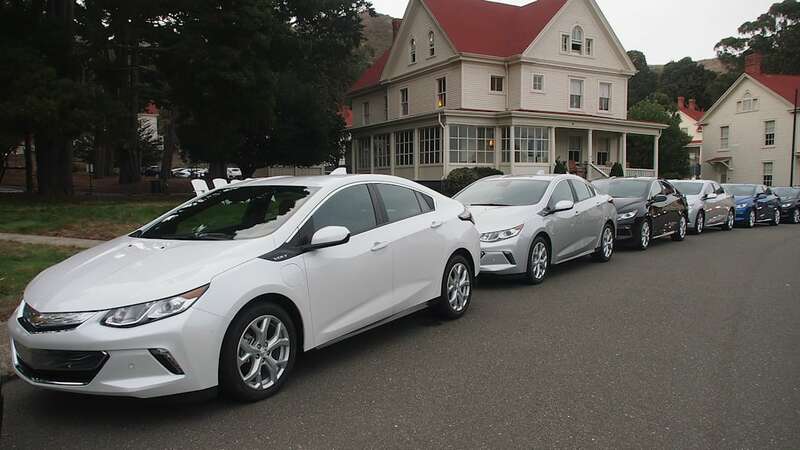 The 2016 Volt comes in seven exterior colors, three of which are a $395 premium choice. 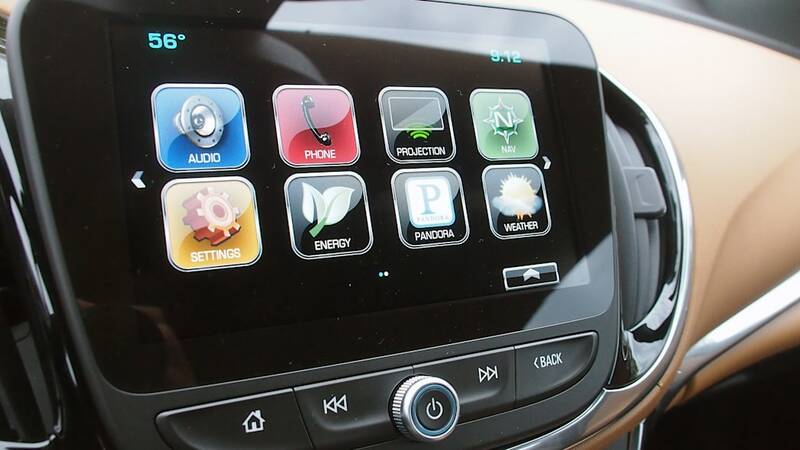 Speaking of options, my volt stickered for $39,830 with two "driver confidence" packages and a nav system. 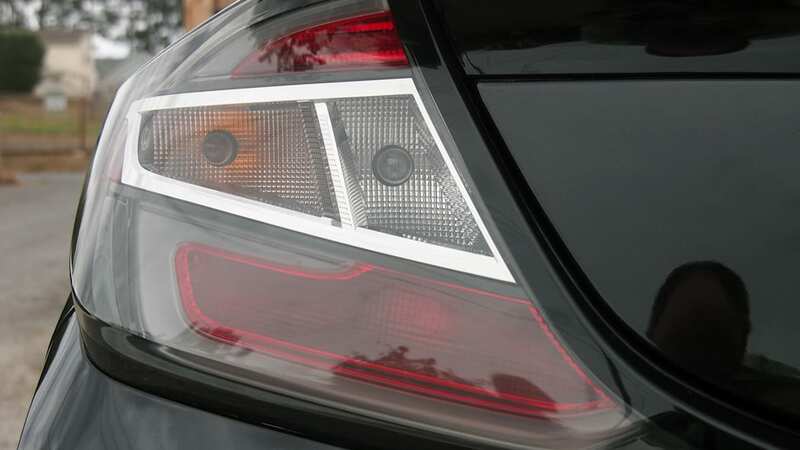 These packages each add $495 to the price, and the first one gives you Side Blind Zone Alert, Lane Change Alert, and Rear Cross Traffic Alert. If you get the first, you can opt for the second, which includes things like Forward Collision Alert, Lane Keep Assist and Low-speed Front Automatic Braking. 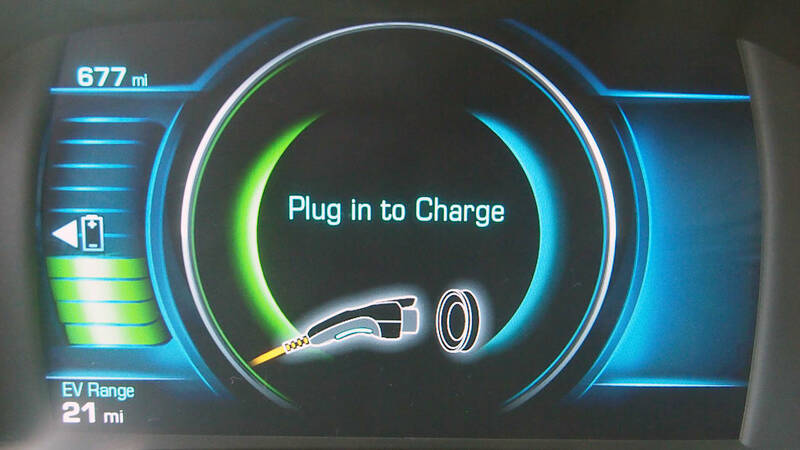 You can chirp the new Volt to 30 miles per hour in a quick 2.6 seconds and a 0-60 run will take you 8.4 seconds. There is only one powertrain option, the Voltec drive unit. This includes the 1.5-liter Ecotec gas engine and an 18.4-kWh lithium-ion battery that sends juice to two electric motors (one offering 87 kW and the other 48 kW and no rare earth metals). 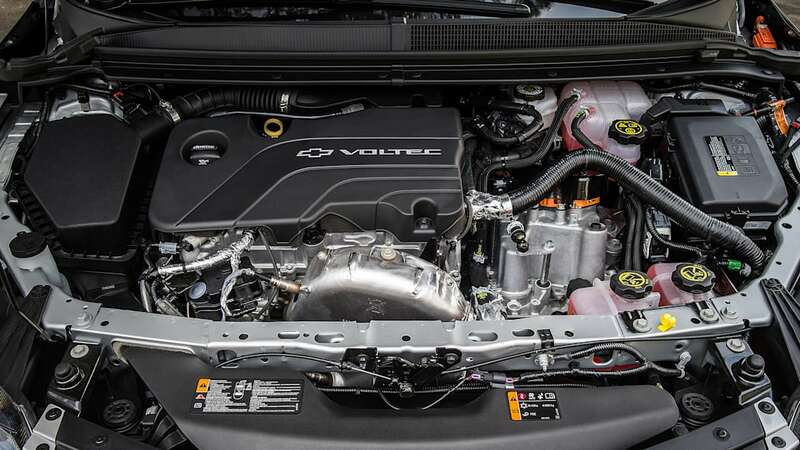 This arrangement is up to 12-percent more efficient and 100 pounds lighter than the older Volt powertrain while still offering 294 pound-feet of torque and 111 kW of electric drive power. More importantly for how the car drives, Chevy has improved both the 0-60 and 0-30 times, by seven and 19 percent, respectively. That means that you can chirp the new Volt to 30 miles per hour in a quick 2.6 seconds and a 0-60 run will take you 8.4 seconds. In the hills of Marin county, this proved particularly fun, especially since the steering feels spot on. It's not mushy or too tight, and feels effortless (in a good way) when you need it in the curves. Even though I've driven just about every plug-in vehicle available in the US and many that you can't get here, I have yet to be bored with the instant acceleration of an electric vehicle. 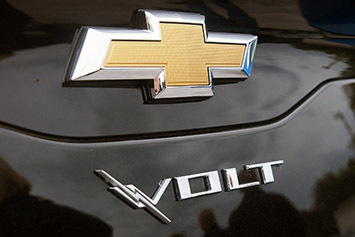 The new Volt comes in near the top of the pack in the "EV Grin" category. The low center of gravity, the 3,543-pound curb weight, and the enhanced body structure all come together in a fun, punchy compact that lets you throw yourself through winding corners without emitting anything from the tailpipe. Of course, once you've spent your battery, the new Volt performs mostly the same, unless you really step on the gas. That's when the loud-ish internal combustion engine makes its presence known and it feels like the acceleration doesn't provide quite as much of a kick as it did when you're only burning electrons. 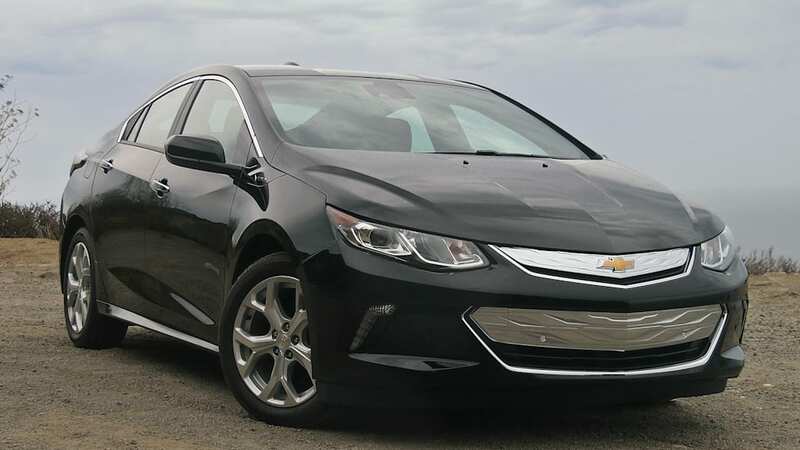 In normal driving, though, going 60 or 70 miles per hour on the highway, you most likely won't notice the engine or hear much wind or tire noise, so commutes of any distance will be managed just fine with the new Volt. The transition when the gas engine kicks on is also imperceptible. You'll have to be paying close attention to notice, even though the cabin is remarkably quiet on normal road surfaces. 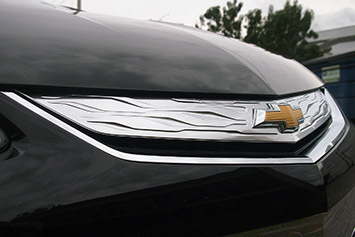 Chevy took a feature from the Cadillac ELR for the second-gen Volt, too. On the back, left side of the steering wheel, there's a little paddle that engages the Regen On Demand feature. In practice, pulling the paddle feels like you've brushed the brake pedal or shifted down a gear. In reality the paddle engages the car's regenerative brakes; an efficient way to recuperate energy and engage the driver. 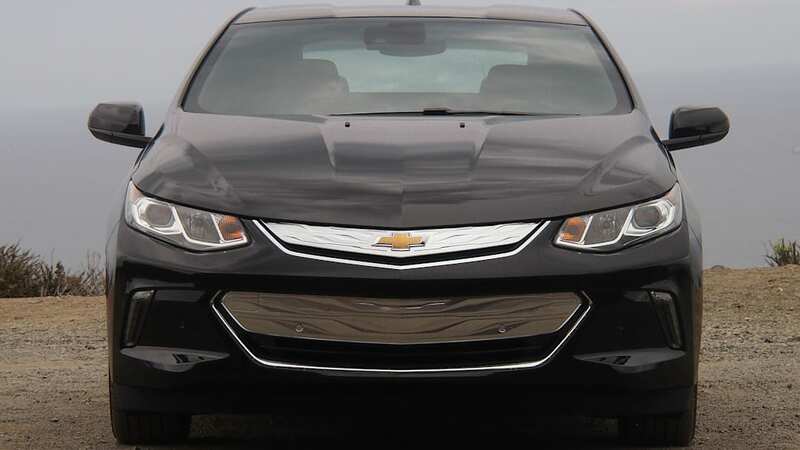 There's real potential for the second-gen Volt to be a big hit. My drive was comprised of two routes, totaling 77 miles. The first leg started off with a full battery, so all 33.2 curvy, hilly miles were completed with 21 miles of EV range left in the pack. The second trip, of 34.6 mostly highway miles, was done using only gas (we didn't have time to recharge) and the display said I managed 39.4 mpg. Combined with my drive partner's time behind the wheel, we put 107.4 miles on the Volt, averaging 77.2 mpg and using up 14.2 kWh of battery for 50.8 miles and 1.39 gallons for 56.7 miles. The long and short of these numbers? It looks like the EPA got it right here. 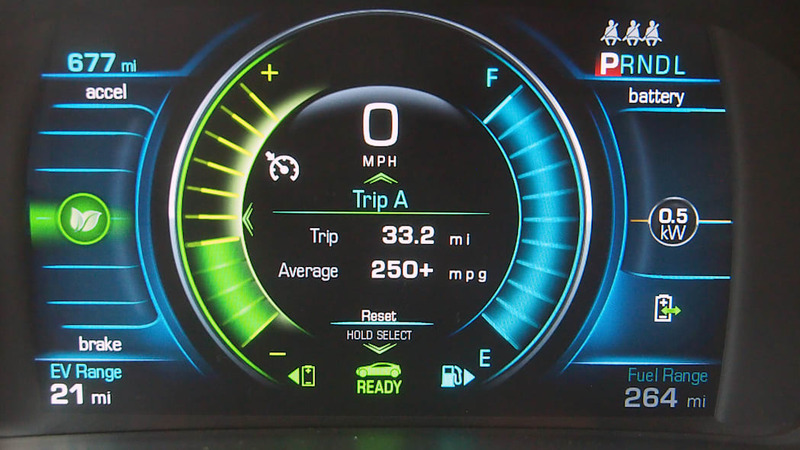 Fifty miles is a totally reasonable distance to expect from the new Volt, and you'll almost certainly get 40 or so mpg if you go beyond that – and you won't need to use premium gas to do so, like you did in the first-gen Volts. So many little improvements. 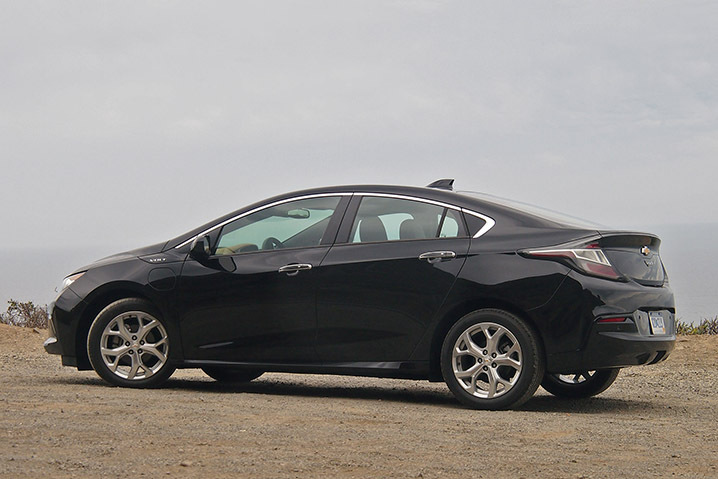 Turns out, the 2016 Volt matches all its hype; it's an efficient, no-compromise EV. 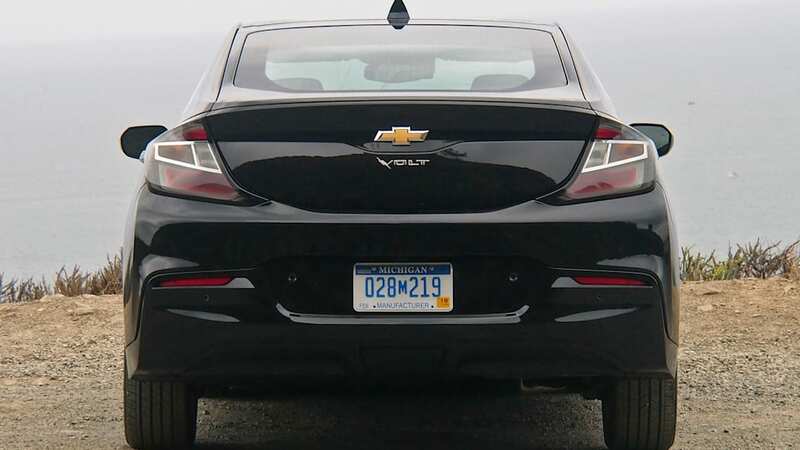 My on-road experience tells me that there's real potential for the second-gen Volt to be a big hit and I've now got my reasons why I think all of these changes, updates, and tweaks will turn a lot more people onto the Volt. Of course, I recognize that gas prices remain low right now, a lot of people still don't understand what it means to plug in a car, and GM still hasn't quite figured out how to market this plug-in hybrid, so there are hurdles to overcome. Still, the pieces are in place. Whether or not these things fly of dealer lots in the next 12 months is a story we will be watching with extreme interest. 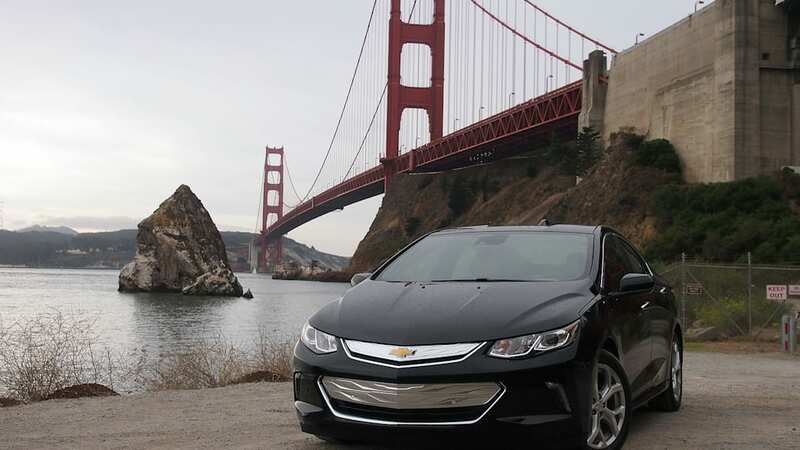 The 2016 Volt will be available in 11 states this fall. The rest of the US will get their first crack at the second-gen Volt with the 2017 model year next spring.